With the recent announcement of MIUI 10, a huge number of new features are getting introduced on lots of Xiaomi devices. 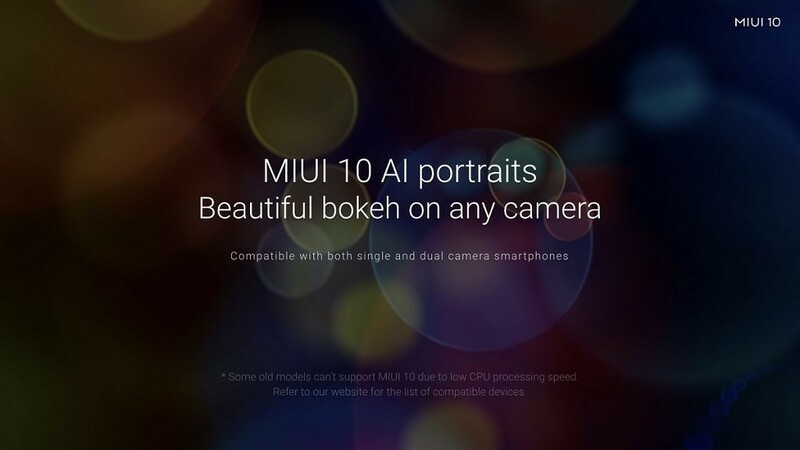 MIUI 10 boasts a brand new redesigned UI, for instance, along with optimizations for speed and artificial intelligence integration for photo taking. Interestingly, the company also announced that by training deep learning algorithms on roughly 100,000 photos, Xiaomi’s single-camera devices will be able to take portrait mode photos on MIUI 10 – though they didn’t confirm which devices would be able to take these photos. However, that changed when the company announced the Xiaomi Redmi Y2 in India yesterday. They confirmed a list of devices that would receive single-camera portrait mode support, with other devices set to be supported “soon” with no ETA given. You can check out the list of devices below that will be able to take portrait mode photos with a single camera. The company also announced two devices that would receive portrait mode on the front camera only. While other devices will also receive the upgrade to MIUI 10, these are the ones that will receive support portrait mode. We don’t know what other devices will be supported at a later date. We can only assume it will be more of the 20+ devices that will be receiving MIUI 10. If you’re interested, you can flash MIUI 10 on a number of devices right now.